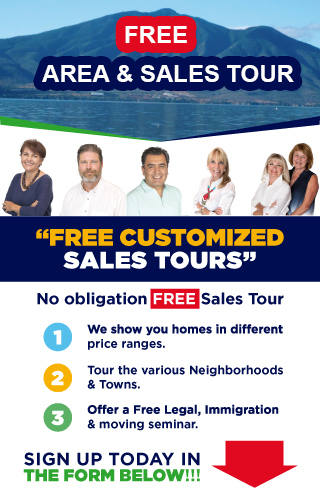 After a long drive from Ajijic Mexico and spending five nights in the first class hotel, the Westin, in Puerto Vallarta, we drove on to San Blas. My friends had invited us to spend a few days at their house. It was an easy drive. What a relief from the first part of our trip. The road was fairly new, no potholes. It was a free road. 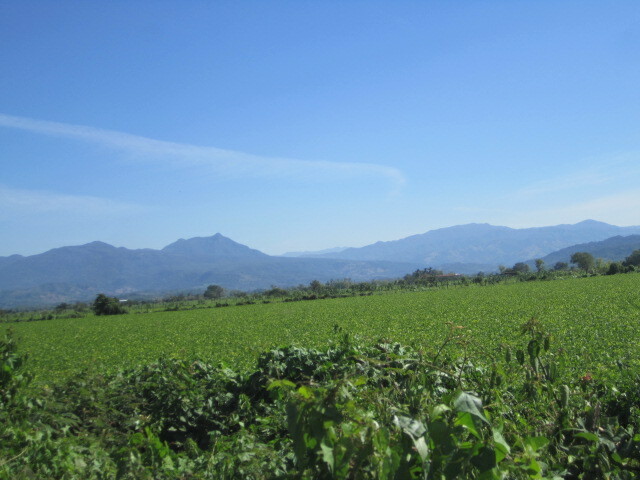 We drove through beautiful countryside that turned into jungle when we got closer to San Blas. There were mountains in the distance in varying shades of blue. This time, we only stopped to take photos. The car didn’t overheat. There was little traffic on the road. As we were getting into the jungle and close to San Blas, we saw the Yaka trees. 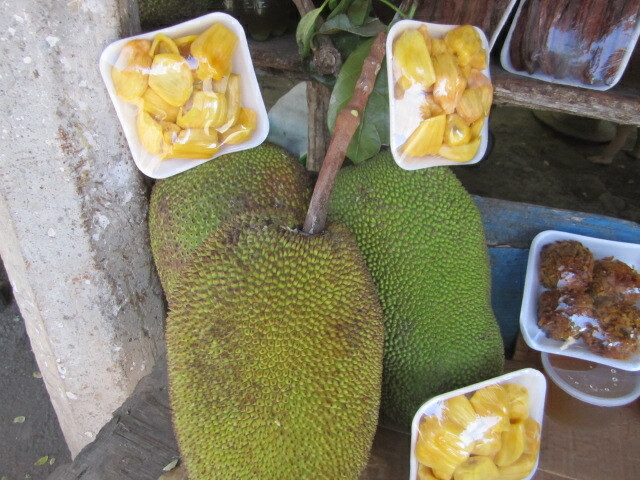 It is also known as Jack Fruit. I bought a small package. We took it as part of a housewarming gift for our friends but I am the only one who ate it. Yaka is something you either love or hate, no in between. The smell is so strong that many airplanes ban it. It mostly grows in the Far East. I ate a lot of it when I was in Thailand. 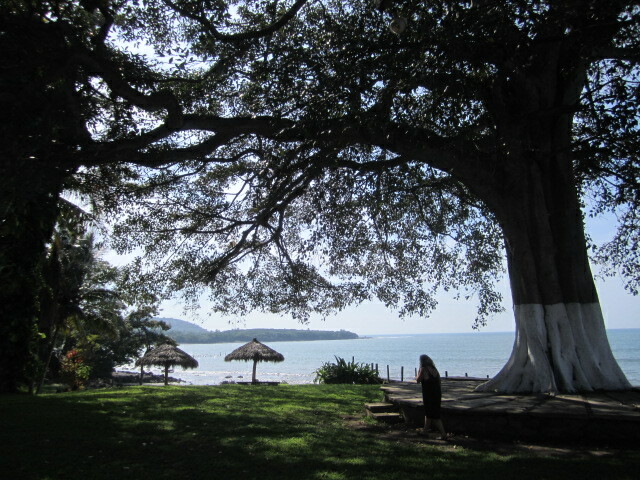 There are many Yaka trees close to San Blas. I love making smoothies with yaka, especially if it is frozen. But it is an acquired taste. More people hate it than love it but it has lots of health benefits. After we arrived in San Blas, my friend Pat took us to the fort. 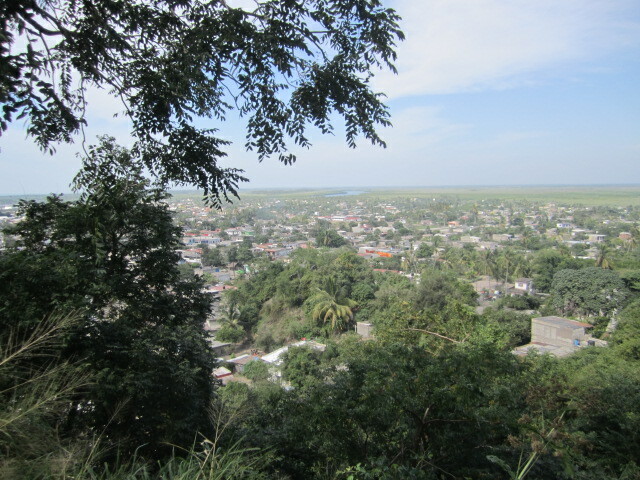 We had a good view of the entire town from there. 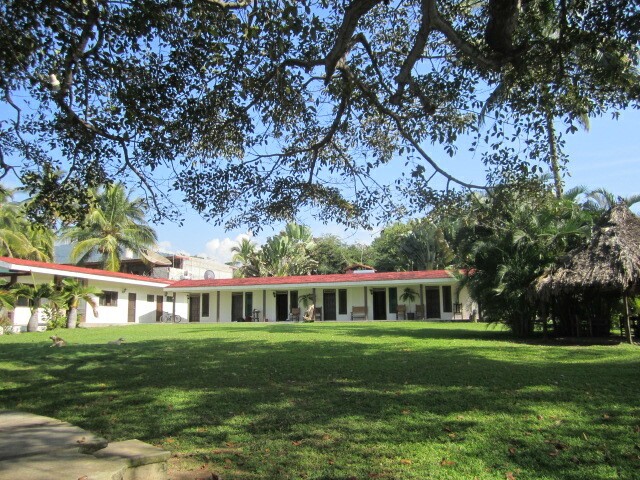 It was rebuilt after hurricane Kenna which hit San Blas in October of 2002. Ninety five percent of the buildings were damaged. Pat was there right after it hit and she said there weren’t even any leaves on the few trees that were left standing. No birds were around either. Boats were on the roads in town. It was a mess. 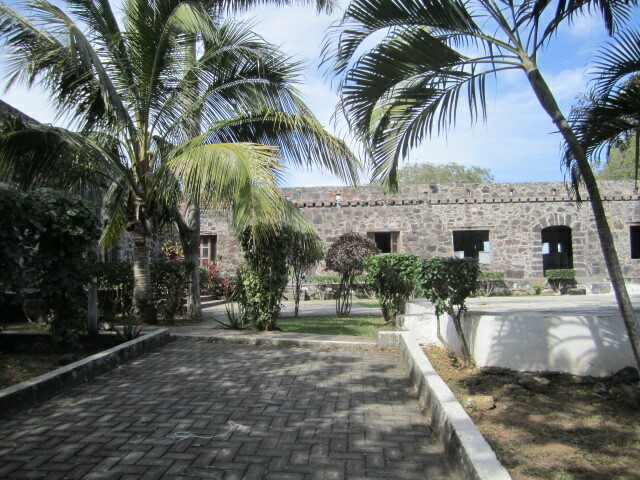 But she still loves San Blas and eventually built a home just below the fort. 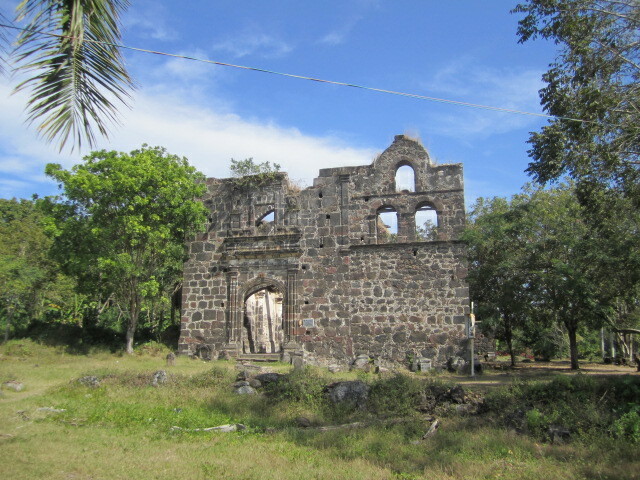 Although the fort was rebuilt, the old church, Church of Our Lady of the Rosary, was not. It was built in 1769. It is still beautiful to see and photograph. 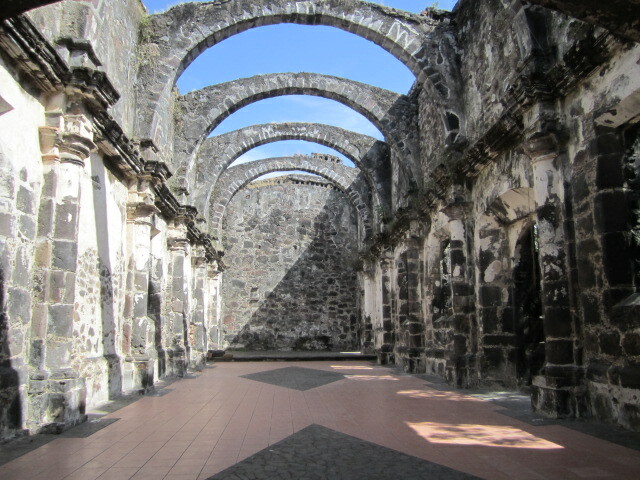 Pat said that many people get married in the church and then have the reception in the fort. The fort was built in 1770 to defend the town’s extensive sea trade with the Philippines. At one time San Blas was a thriving seaport. For about twenty years in the late eighteenth century, San Blas was one of the busiest ports and ship building centers on the Pacific Coast. The town grew to thirty thousand people. Now it has only around ten thousand people and is no longer a thriving seaport. Maybe the jejenes drove everyone out except the very hardy. 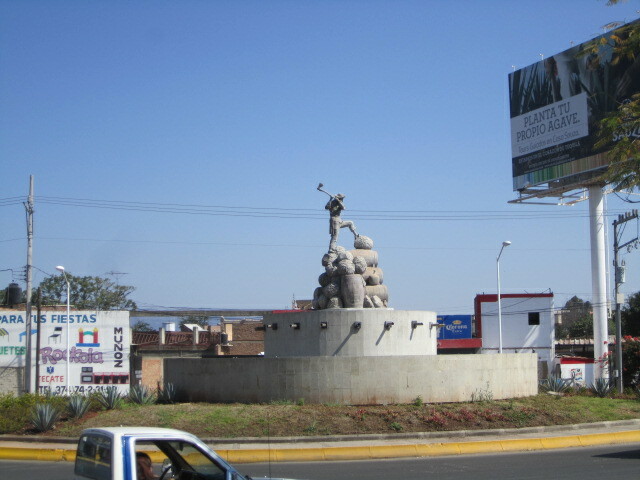 San Blas was founded in 1530 but not officially until 1768. It was a naval base for the Spanish Navy in 1768. 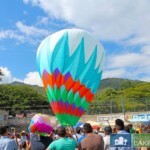 It is 160 km north of Puerto Vallarta and 64 km west of the state capitol of Tepic. I loved taking photos up around the church and fort. 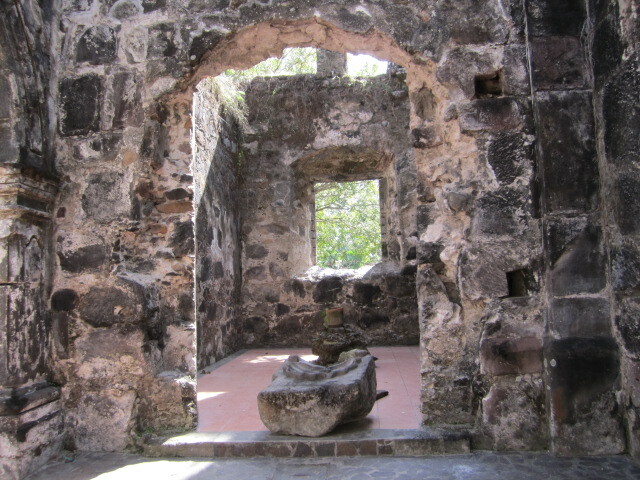 This alcove would be a beautiful setting for a wedding ceremony. 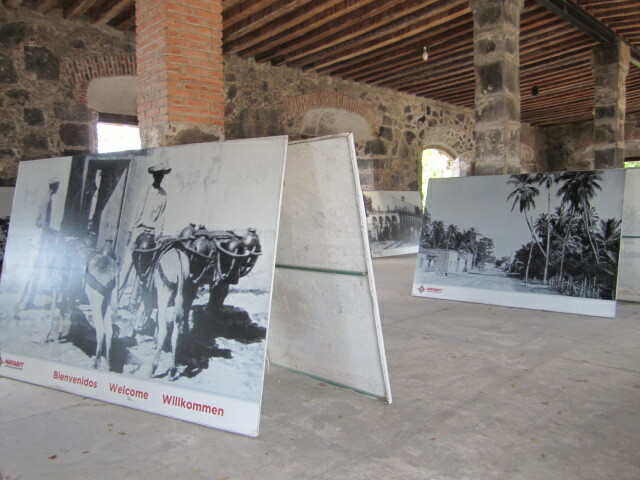 I liked looking at all the photos of San Blas that were displayed in the fort. Not much has changed there. It is still a small town. If it weren’t for the jejenes, this would not be the case. My friends in San Blas are grateful for those little biting bugs because they keep the town from becoming another overbuilt beach resort area. Not everyone is bothered by them. My friend Tammy left with many bites all over her. I had very few. No accounting for their taste in blood. Maybe they just like new blood. Tammy had never been there. I had. I was told by a doctor that jejenes and mosquitoes don’t like perfume. I was told by other people that perfume is exactly what attracts them. Also beer. A beer drinker said that they don’t like it if you have beer in your body. Non beer drinkers have told me the opposite. 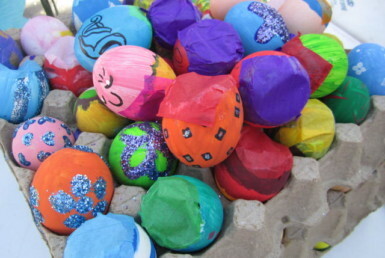 There are many myths and superstitions that surround the jejenes and how to avoid them. I think it is just the luck of the draw. If they don’t like you, San Blas is a great place. If they like you, then you won’t stay long. The big difference in San Blas from the past is now there are cars, motorcycles and bicycles instead of horses for transportation and the style of clothing that the people wore then was much more traditional. Otherwise, it is still a town that time has forgotten. If you like a slow pace of life, then San Blas is for you. If you like to feel close to the beauty of nature, then San Blas is for you. If you like friendly people, then San Blas is for you. 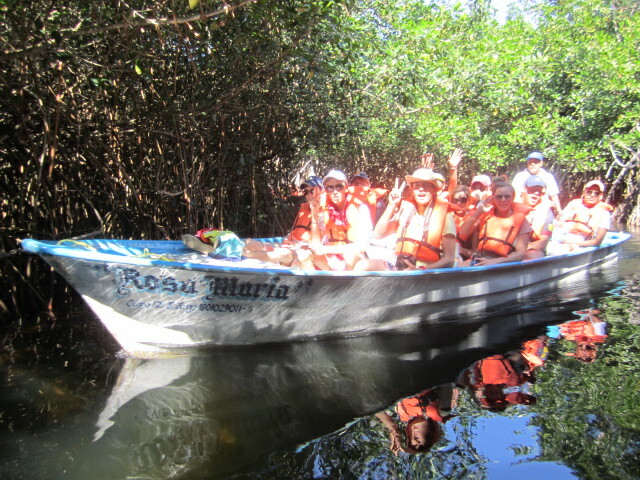 The next day we took the jungle boat ride. 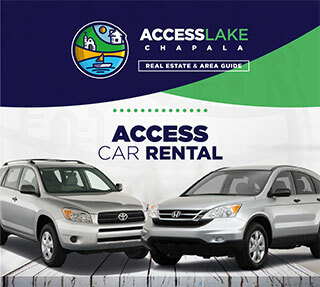 It is possible to get a boat just outside of San Blas and it will take you to the main area where most people join. That makes the ride about twenty minutes longer and much more interesting. 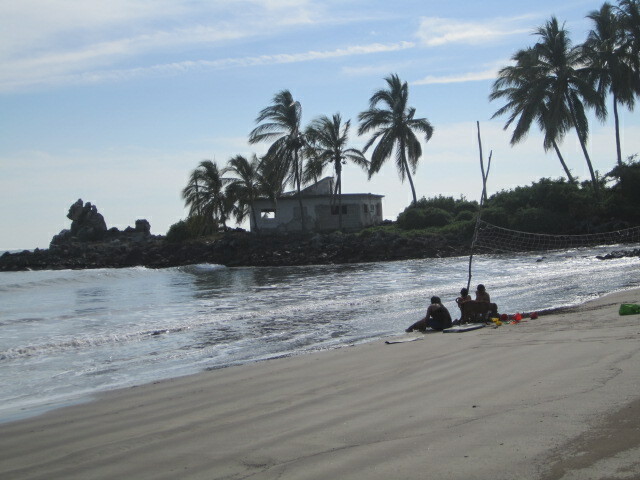 We went early in the morning so we could enjoy it without all the tourists from Puerto Vallarta. They come into the main loading area by the busloads a little later in the afternoon. My friends Pat and Tammy are camera shy so I only have a photo of me on the boat. I don’t like my picture either but someone had to be brave and put one on. Since it was my article, I was the unlucky one. The man who took us on the boat has a good eye for wildlife. He has probably been doing that job all his life. He stopped many times for us to take photos. 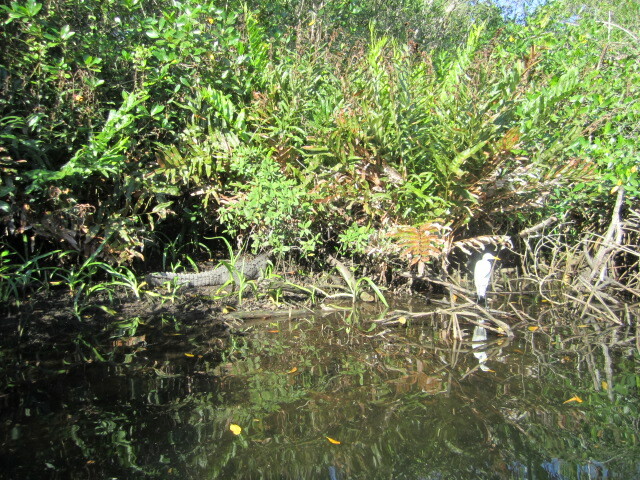 If you look closely to the left in this photo above, you will see a crocodile’s tale. I wonder if that bird didn’t see it….. Or maybe he knows the crocodile’s eating schedule. This may have been after his breakfast. 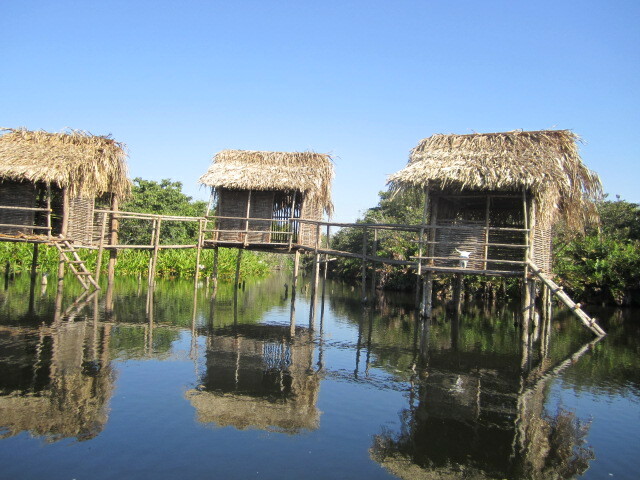 These huts were built several years ago for a movie set. I never saw the movie. 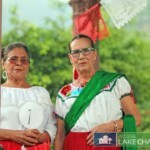 It was in Spanish and they used many local people for it. It was titled La Cabeza de Una Vaca, in English, The Head of a Cow. No one has ever lived in the huts. They just keep rebuilding them to look interesting for the jungle boat rides. At the end of the ride is a small restaurant and a pool where you can swim. There is a fence up at the side where the river flows into it so the crocodiles can’t get through to make swimming too interesting. Pat and Tammy both swam but I sat and watched. There were many catfish in the water too. It was very peaceful up there. The boatman waited for us to eat and then took us back to San Blas. This ride and visit at the restaurant was one of my best memories of the vacation. Four other people were there and the young ones got up the courage to jump into the water from a rope swing. I managed to capture a girl in motion in the above photo. On our way back down the river, four boats past us as they were going up to the pool. I was glad we had gotten there first. The restaurant had no electricity that day and they had very little food to serve. I liked the peace and quiet of an almost empty place. These people came in from Puerto Vallarta on a tour bus. 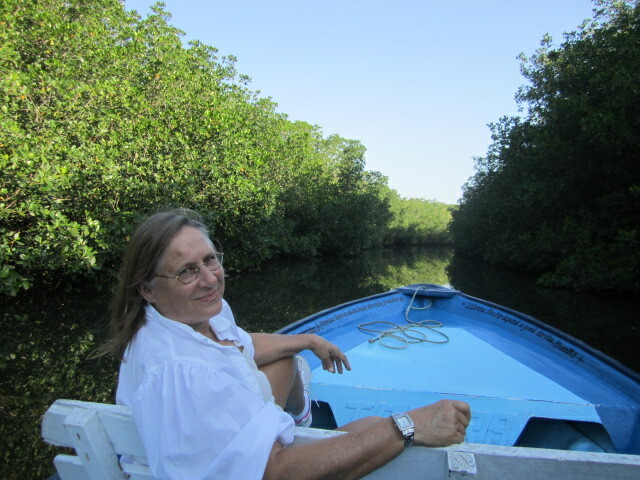 The next day we explored the areas along the water to the south of San Blas. We saw some beautiful small hotels and restaurants. We rarely saw people on our day trip to the resorts and beaches. That was a pleasure for me. I enjoy deserted places. 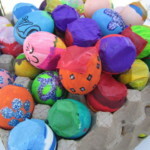 No one pressured us to buy anything or give them money. That is not the case in Puerto Vallarta which was crowded and the people were always wanting us to buy something or give them a tip for one thing or another. Many times I had no idea of what we were tipping them for. Maybe just because we were rich Americans and they were poor Mexicans. It was our wealth tax. The three photos above were all taken in one resort area. It is one of Pat’s favorite places so she likes to visit it. I didn’t see the room prices. We just stayed long enough to walk around the grounds and take some photos. 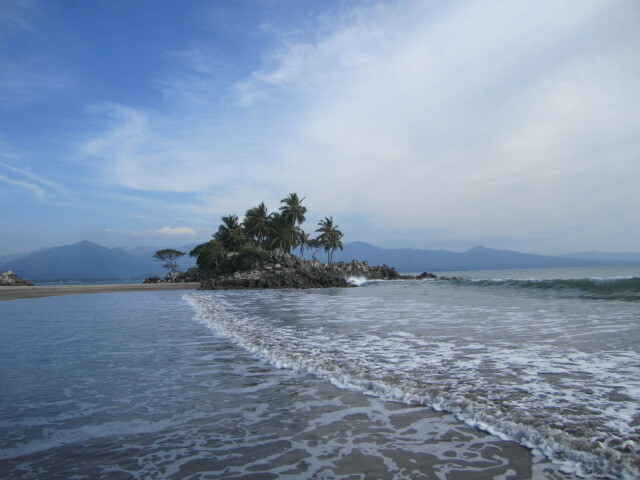 These two beach photos were taken at Las Islitas beach which is just south of San Blas. 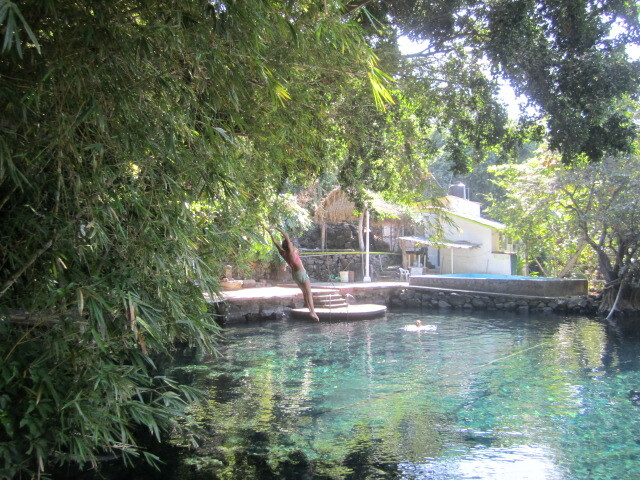 It was a beautiful day with few jejenes and we swam for awhile. The food at these beach restaurants is delicious and very inexpensive. Lots of shrimp and fish dishes. I didn’t get any photos of Borega beach which is in San Blas. My camera was not working properly so I also didn’t get photos of the town either. I wrote another article about San Blas when I was there two years ago. Since the town doesn’t change much, if you look at that article, you will see what the beach and town are like. It is titled, A Visit from Ajijic to San Blas Nayarit Mexico. Dated 2012/01/28. I was there for about a month that time and took many photos. 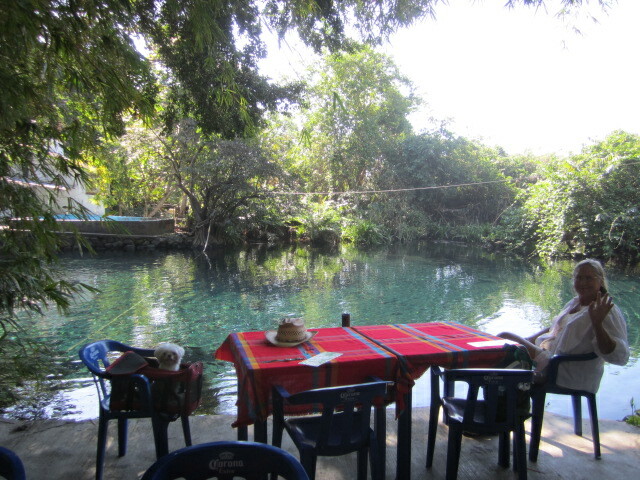 We stayed in San Blas for three nights and then got up early and drove towards Guadalajara. This time we took the toll roads. It was expensive but well worth the money. 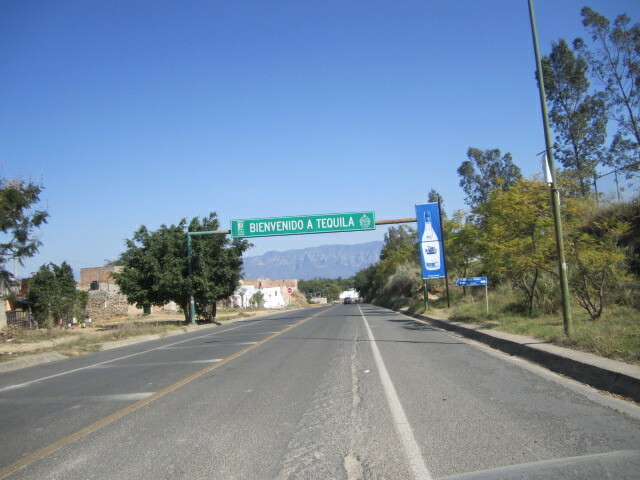 We took a side trip to the town of Tequila. 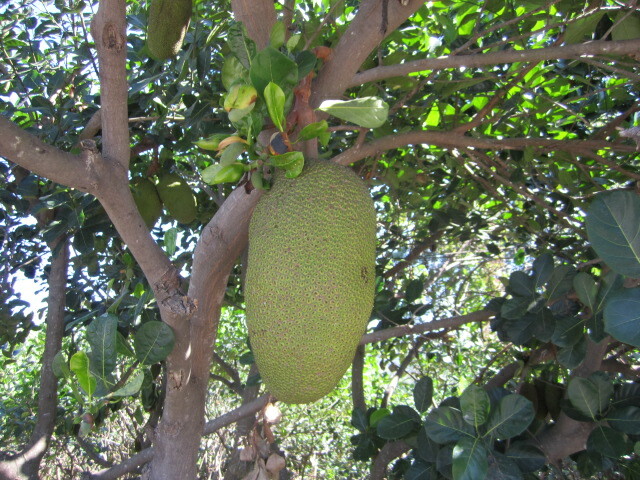 It is surrounded by Agave plants. They make and sell lots of Tequila there. 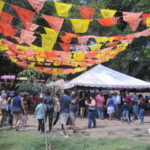 There are often tours from Ajijic to Tequila. 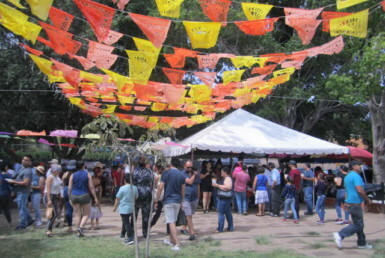 Guides take people through the factories where they are served free tequila samples. If you are a drinker, then a tour is the way to go. There are bus tours and train tours. I bought a bottle of tequila for my friend in Ajijic. 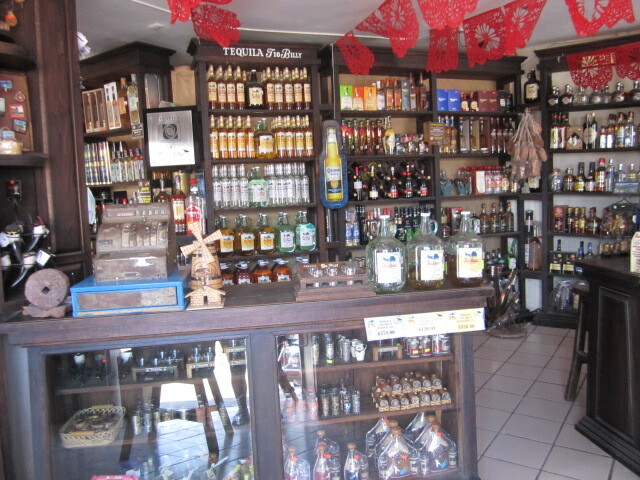 If you look on the right on the counter, you will see three huge bottles of tequila for sampling. They are clear tequila, medium and dark. I tried two samples and bought the dark one. It was a bit smoother than the clear one. We ate lunch next door to this store. I walked over to it while Tammy was at the restaurant and from there to the store I saw two elderly men passed out on the sidewalk. And this was mid afternoon. I wonder what the town is like in the night time. Tequila is very inexpensive there and easy to get. Must be a real party town. 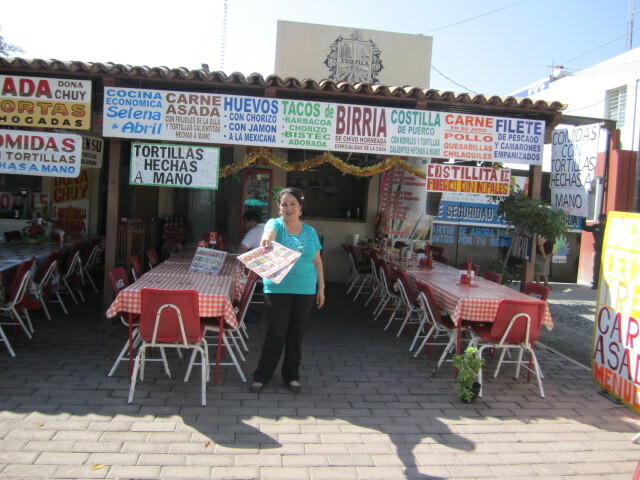 There were three little restaurants in a row and women in front of each one, offering us their menus as we drove up, even before we parked the truck. Not many tourists were in town that day and the restaurants were almost empty. It was hard to chose one and leave the other two women disappointed but we could only eat one lunch each. 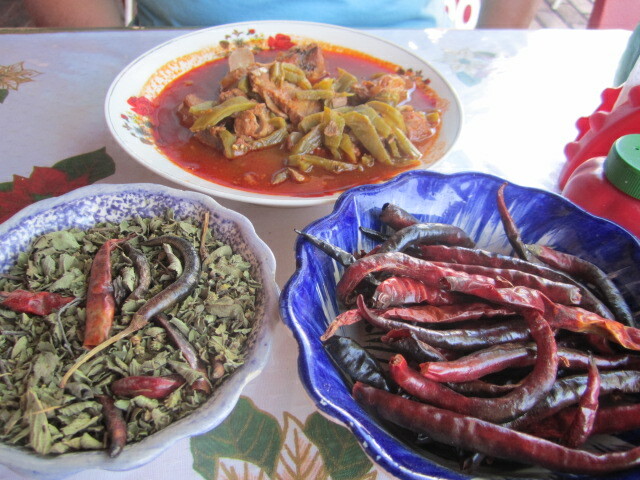 Above is Tammy’s meat dish and two side pepper dishes that were already on the table. She didn’t much like the stew. It was mostly bones. We made the wrong choice of restaurants but we had fun anyway. When you travel, you have to be flexible and not expect everything to always be up to par. The friendly older woman who served us made up for the bad food. A smile can make up for a lot of other things that don’t quite live up to expectations. 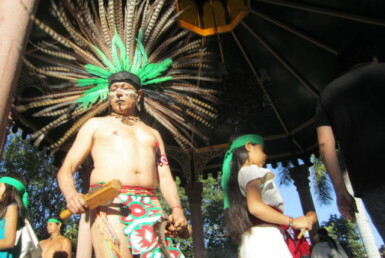 The photo above is of a man chopping an agave plant. We drove on to Guadalajara with no problems. It was one of the best vacations I have ever had and I highly recommend both Puerto Vallarta and San Blas. San Blas will be a special treat if you are lucky enough not to be liked by the jejenes. It is hard to tell in advance of a trip but if you are liked by mosquitoes, you will also be liked by jejenes. Sorry. You can try all the tricks; drinking beer, not drinking beer, wearing perfume, not wearing perfume, taking massive doses of vitamin B in advance, etc. But the only way you will know if San Blas is for you or not is to go there. Tammy came away with hundreds of bites. I had none. I would always be willing to visit San Blas again. She would not go back. One more comment about the jejenes. They are worse at sunrise, sunset and full moons. Loved your article! 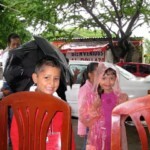 We vacationed for many years in PV, but never visited San Blas. Now that we winter in Ajijic, we would like to drive there. 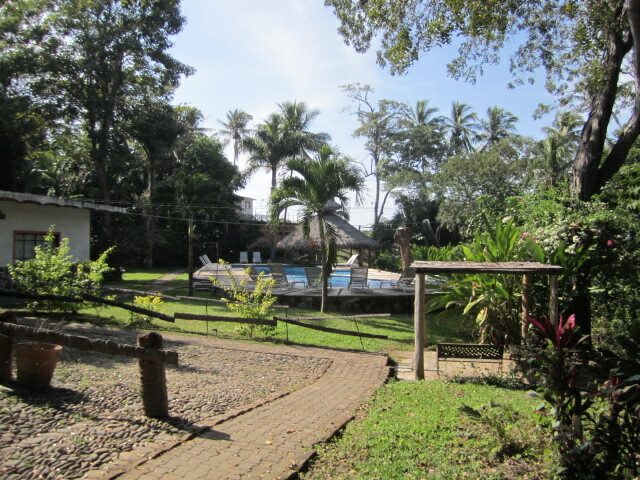 Would you please email me the name and address of the resort pictured in San Blas? What does jack fuit taste like? We visit San Blas for just a few hour stop and eat in Mire Mar could you please give me the name of the resort in San Blas we would love to stay a week in the future.